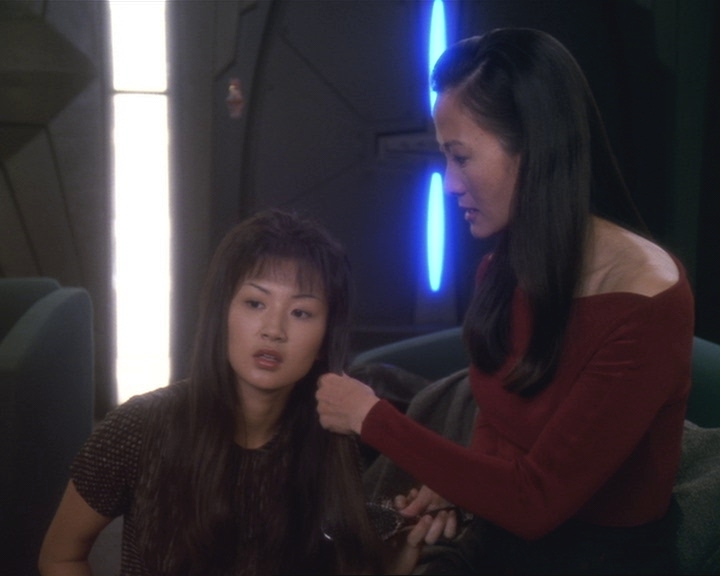 Keiko and the family have returned to Miles onboard DS9 after the station was taken back from the Dominion and they decided to take a trip to Golana IV for a family picnic and for a little bonding between Miles and his children. It's a beautiful day on the uninhabited world and Molly cart wheels aways and then we hear a scream, Miles frantically searches for here finally finding her hanging on a small ledge above a strange fluctuating energy field inside a small cavern, he reaches for her but she falls out his grasp and vanishes into the energy field. Science teams from DS9 are investigating this unknown technology and Dax believes it's a time portal and Molly has been thrown back around 300 years into an empty world but if they can get the tech working again they believe a transporter beam can lock onto her DNA signature and beam her back. They are successful but the girl they bring back is much older but there is no question that it is Molly and the DNA scan confirms this but after sedating her they now have to deal with a feral creature who doesn't recognise her surroundings or anyone. 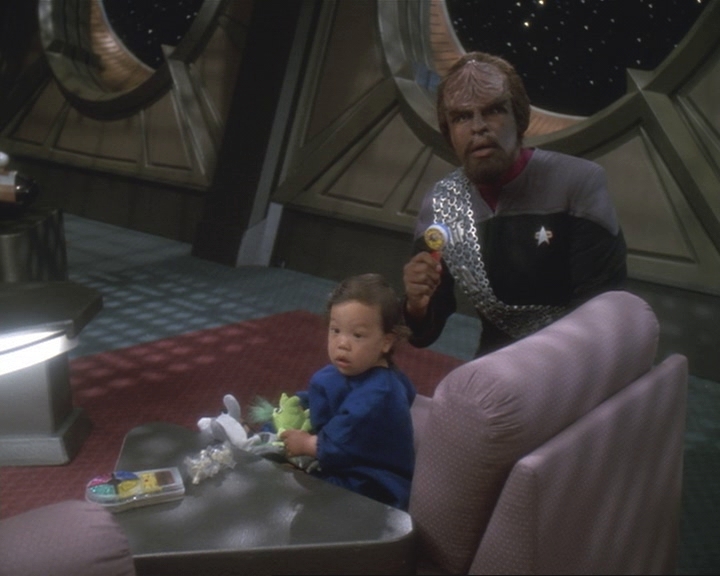 Worf babysits Yoshi O'Brien which allows Miles and Keiko to concentrate on Molly who is now living in a cargo hold converted to a habitat but with mixed results. Slowly but surely they gain Molly's trust but she pines for her home and while a major breakthrough occurs when they take her back to their quarters it's not until they use a holodeck to simulate Golana IV that Molly is truly happy. It ends badly when Quark asks them to leave and as the hologram is turned off Molly panics and in her terror and confusion she attacks a guy in the bar wounding him severely. Molly is placed in detention and is expected to be shipped to a suitable facility but Miles and Keiko decide that the only place Molly will be safe is back in the past where her real home is so they attempt a jailbreak, it fails. Odo however lets them go and now back on the planet Miles activates the time portal and Molly is told to go "home", they give her the doll she had as a child and with a final goodbye and joy on her face she steps through. Three hundred years in the past Molly hears a young child sobbing, she finds young Molly sitting in the shadows and gives her the doll and points to the portal and young Molly returns to the arms of her parents. So Keiko is not overly impressed with Miles having put on a few pounds although we can assume they boinked like rabbits the night before so he can't be that bad although Quarks adult novelty outlet may have helped in this regard. I was a little disappointed that they still used sunscreen, this is scifi guys take a pill or shot that boosts the skin's protection, job done but I let that go since Miles was his henpecked best even down to his sausages. Of course when one or two characters go overboard saying how they will never leave and everything will be great you just know things are going to go turn out badly. 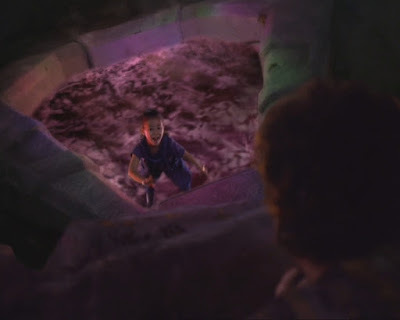 I was a little confused when they got to the planet, I didn't pick up any indication that this wasn't Bajor so the appearance of this hidden alien technology didn't make a lot of sense but later in the episode they make it clear Golana IV is an uninhabited world the Bajorans had lay claim too. Once you know that then yeah it is possible that this time portal remained undiscovered but surely the shuttle/runabout sensors on a normal landing procedure would have picked up the energy field. I was rather surprised the tech guys from DS9 were so happy to dismantle the portal's control systems so quickly and it was maybe a reach to accept a transporter beam (or similar device) could penetrate the portal, identify a target via DNA and bring them back. Of course it went wrong since they simply did not have the fine control they needed to pinpoint to the second when Molly arrived so having brought back a feisty 18 year old who immediately went postal they took their sweet time sedating her or even stunning her. Fortunately over the ten years Molly had been stranded she felt the need to remain fully clothed which spared the blushes of many but then the question of what to do, interesting the choice to keep her was not one sided, the point was made this Molly had ten years which they shouldn't take away from her. Ok, yes she did but that would probably be ten years of hell for at eight years old and only casually clothed having to find food and water and shelter not to mention while there were not sentients on the planet I'm sure their were native animals. Now maybe this is just me but security and research team should have been stationed at the time portal, it's value and danger is pretty evident but not to worry Miles got it up and running again and they ushered 18 year old Molly through and back home. It would have been interesting if they had left it there, the loss of a child could have been used to really pressure Miles and maybe breaking up the marriage as a side plot to the final season but no they went for the happy ending and maybe that wasn't a bad thing. Time's Orphan worked pretty well considering it was a Mile's and family centric standalone episode although I really did enjoy Worf and his adventures in babysitting but there were some touching moments in a plot that pretty much overlooked a lot of issues. There was some nice acting from Michelle Krusiec (Molly at 18) and if anything she was the one that get's the most credit at making this episode above average.